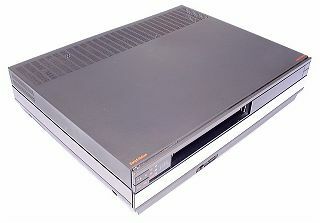 The first B&O VHS recorder. It is in fact a well disguised Hitachi VT17, though there are some differences. Firstly, an electronic search tuner replaces the thumbwheels on the original, 2-track linear Dolby stereo sound with simulcast mode recording is provided and the long play circuitry is removed, the 4-headed disc replaced with a standard 2 head one, presumably as the reduced resolution of long play did not sit well with B&O’s quality image. There are also changes so that the Beovision Video Terminal can be used, and a 6 pin DIN AV socket is provided, to allow easy direct connection with Beovision models fitted with the accessory AV terminal module. On later versions this socket was replaced with a Scart type. 4 phono sockets allow audio connections to be made to the Tape 2 sockets of a Beomaster, such as the 2000. Text copyright © Beocentral. Unauthorised reproduction prohibited.